It has been a long time since I last wrote anything on this occasional blog. I'm at Drama school doing the costume construction course. At the moment I am spending pretty much all my spare time working on making the costume for my 'Major Work' for the Costume Showcase on 22nd of September. Costume showcase shows all the costumes that the students have completed this year. For the graduating students it is a chance to really show off. I am trying to reproduce the costume worn by this lady below. 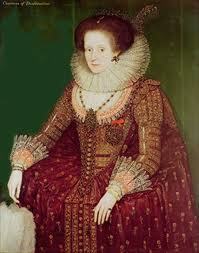 This is a portrait of Margaret Hay, the Duchess of Dunfermline in the 1600's. It was painted by Marcus Gheerarts the younger, in 1611 and the portrait is held in the Dunedin Art Gallery. A very potted history - Margaret and her husband were left in charge of Dunfermline castle when James 6th of Scotland became King of England and Scotland after Elizabeth the 1st died. Evidently they were extremely rich. Margaret is wearing a silk satin dress embroidered with gold thread, a bobbin lace ruff, cuffs and partlett, she is dripping with jewels including a big pendant, a huge brooch and a jewelled coronet in her hair. My challenge is to try and make her whole outfit with a budget of a bit over NZ$200. I spent weeks going into every fabric shop in Wellington trying to find suitable red fabric within my budget which also had to include money for lining fabric and all the other layers she is wearing. In the end I had to use cotton drill and overdye it to get the right colour. Then I screenprinted in on the table tennis table in my garage. I'm really happy with the way it turned out. Luckily we are also allowed to use stuff that is in our own personal stash (like lace and stuffing and beads). The petticoat in the photo is a borrowed one but mine is similar. A petticoat (made of 10 metres of calico in two layers. In my opinion making this was about the equivalent of machine quilting a king size bed quilt. I'm in the middle of completing the buttons which I am making by hand by embroidering around beads. I got the instructions from a website but can't find the address right now. I don't want to show all the pieces until after the show but will try to put some detail shots up of the printing and beading. Next I have to start on the bodice and sleeves but they may have to wait till next term. During the next holidays which start this Friday 17th June, I am off to Adelaide to do work experience in the costume room at the State Theatre. I'm hoping to work on some of the jewellery while I am over there staying with my cousin. If you are having a clearout and want to get rid of lace, ribbons, beads, feathers (particularly ostrich feathers) and costume jewellery please consider sending them my way :-), I'll refund postage. I am also looking for hat-making blocks and will swap for hand dyed fabric. Housework has been a bit neglected recently and today is the first non-rainy day for quite a while. I think I had better go and wash 4 loads of washing. Tune in for more costume making catch-up over the next few weeks. I have a box of lace bits which have arrived at my house this very day - and there are definately things in there which will be more use to me than me... Do you want it before you skip town or after?